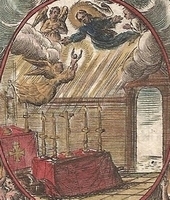 Her life from that point became a series of strange incidents cataloged by a Thomas de Cantimpré, Dominican professor of theology at Louvain who was a contemporary who recorded his information by interviewing witnesses, and by Cardinal Jacques de Vitny who knew her personally. She exhibited both unusual traits and abilities. For example, she could not stand the odor of other people because she could smell the sin in them, and would climb trees or buildings, hide in ovens or cupboards, or simply levitate to avoid contact. She lived in a way that was considered poverty even in the 13th century, sleeping on rocks, wearing rags, begging, and eating what came to hand. She would roll in fire or handle it without harm, stand in freezing water in the winter for hours, spend long periods in tombs, or allow herself to be dragged under water by a mill wheel, though she never sustained injury. Given to ecstasies during which she led the souls of the recently dead to purgatory, and those in purgatory to paradise. People who knew her were divided in their opinions: she was a holy woman, touched of God, and that her actions and torments were simulations of the experiences of the souls in purgatory; she was suffering the torments of devils; she was flatly insane. However, the prioress of Saint Catherine's convent testified that no matter how bizarre or excessive Christina's reported actions, she was always completely obedient to the orders of the prioresses of the convent. Christina was a friend of Louis, Count of Looz, whose castle she visited, and whose actions she rebuked. Blessed Marie of Oignies thought well of her, and Saint Lutgardis sought her advice. One of six brothers born to a poor farming family. 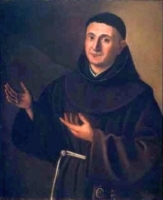 He was known as a pious child, and at age 7 or 8 he ran away from home, planning to join the Friars Minor; his mother sent his brothers to find him and bring him back. He served as an altar boy as often as he could, and when old enough he worked as a nurse in a hospital run by the Order of Saint John of God. Ordained a priest on 20 March 1663 in Badajoz, Spain. Military chaplain to the Spanish army that was fighting in Portugal, but ill health forced him to return home. In 1667 he became a hermit in the mountains of El Bañuelo, and after studying the teachings of Saint Francis of Assisi, he joined the Third Order Regular of Saint Francis in 1671, taking the name Cristóbal of Saint Catherine. Founded the Franciscan Hospitallers of Jesus the Nazarene in Córdoba, Spain on 11 February 1673 to care for the physical and spiritual needs of the sick; they received approval from Pope Benedict XIV in 1746. Father Cristóbal died holding a crucifix, a victim of cholera which he caught while tending to other patients during an epidemic. Born to a wealthy pagan family. Converted as a youth, she destroyed all the idols in her father's house; those of gold and silver she broke up and gave to the poor. Scourged, tortured, and martyred for her new faith. Her story and that of Saint Christina of Tyre seem to have been confused and combined in rewrites through the ages. Son of a mule driver. Raised by an uncle who opposed the boy's youthful piety. The boy's favorite book was Thomas a Kempis's The Imitation of Christ. 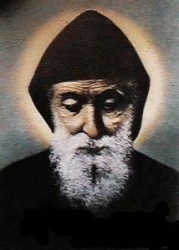 At age 23 he snuck away to join the Baladite monastery of Saint Maron at Annaya where he took the name Charbel in memory of a 2nd century martyr. Professed his solemn vows in 1853. Ordained in 1859, becoming a heiromonk. He lived as a model monk, but dreamed of living like the ancient desert fathers. Hermit from 1875 until his death 23 years later, living on the bare minimums of everything. Gained a reputation for holiness, and was much sought for counsel and blessing. He had a great personal devotion to the Blessed Sacrament, and was known to levitate during his prayers. Briefly paralyzed for unknown reasons just before his death. Several post-mortem miracles attributed him, including periods in 1927 and 1950 when a bloody "sweat" flowed from his corpse. His tomb has become a place of pilgrimage for Lebanese and non-Lebanese, Christian and non-Christian alike. Second of eight children born to Juan and Eulalia. As a child, she would often visit her uncle Florentino, a priest who was later martyred in the Spanish Civil War At age nine she made personal vows of chastity and devotion to the Blessed Virgin Mary, and in 1918 she moved to an Ursuline boarding school. Having read Story of a Soul by Saint Therese of Lisieux, she felt drawn to the Caremelite life, and on 2 May 1925 she became a Discalced Carmelite at the Carmel of San José de Guadalajara, taking the name Teresa of the Child Jesus and of Saint John of the Cross. Organist. Made her solemn vows on 6 March 1930. She spent her free time in Eucharistic adoration, "sunbathing" she said, in its light while she prayed for priests and conversions. Martyred in the Spanish Civil War. The mob that murdered her offered her freedom if she would say "Viva el Comunismo!" ("Long live Communism"); she answered "Viva Christo Rey!" (Long live Christ the King!). After Vladimir's death, the kingdom was to have been divided among his sons, but their eldest half-brother, Svyatopolk, wished to rule alone. An army gathered to defend Boris, but he called them off, explaining that he could not raise a hand against his brother; Boris was soon killed by Svyatopolk's followers. Svyatopolk invited Gleb to Kiev, but on the way, his boat was boarded on the Dnieper River near Smolensk, and he was killed. In 1020 another of Vladimir's sons, Yaroslav, usurped Svyatopolk, and then buried the bodies of Boris and Gleb in the church of Saint Basil at Vyshgorod. Miracles were reported at their tomb, and it became a site of pilgrimage. From the first, the highest motives were attributed to the brothers' resignation - unwillingness to repel injustice to themselves by force and violently oppose an elder brother. Not martyrs in the traditional sense, the Russian Church perceived them as "passion bearers" - blameless men who did not wish to die but refused to defend themselves, thus voluntarily submitting to death like Christ. 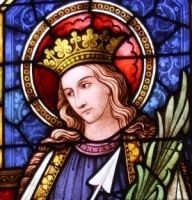 Daughter of King Béla IV of Hungary and Maria Laskarina; sister of Saint Margaret of Hungary and Blessed Jolenta of Poland; niece of Saint Elizabeth of Hungary; great-niece of Saint Hedwig of Andechs. Reluctant member of Polish royalty when she married Prince Boleslaus V, but it was a political marriage, and the pious couple lived as brother and sister; when Boleslaus became Prince of Cracow, became a princess of Poland. Noted for her charity to the poor and personal care for lepers. Founded a Poor Clare convent in Stary Sacz, Poland. Widowed in 1279, she gave away her wealth and retired to the convent as a prayerful Franciscan tertiary, turning her back completely on governance and worldly life. Educated at Queen's College, Oxford, England from 1569 to 1572. Fellow at Queen's College. Convert to Catholicism in 1576 at Brome, Suffolk, England. Resigned his position at Oxford, and studied in Rheims, France in 1580. Ordained on 4 March 1581. Returned to England in April 1581 as a missioner to the northern counties, often disguised as a servant in the livery costume of Lord Montacute. Assisted in his mission by Blessed John Speed. He became the object of an intense manhunt, was betrayed by Francis Ecclesfield near Durham, England on 5 July 1593 at the home of one William Claxton, and arrested. He was sent to the Tower of London where he was crippled by being tortured on the rack. Sent to Durham in July 1594, where he was tried for the treason of being a priest. Martyr. 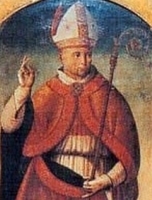 Born to a pious noble family, the son of Berardo X, Count of Marsi; his brother Rainaold became abbot of Montecassino Abbey, and created cardinal by Pope Innocent II in 1138. Benedictine Cistercian monk at Clairvaux Abbey. Spiritual student of Saint Bernard of Clairvaux. Abbot of San Matteo di Montecchio monastery on Lake Montecchio in 1130. Abbot of the Saint-Sauveur monastery in the diocese of Rieti, Italy. Young girl imprisoned for her faith. Her mother tried to argue her into making the required pagan sacrifices, but Christina refused, and was executed. Martyr. Due to the details of her martyrdom, listed below, she's likely a pious fiction, but was highly honoured in Greece for centuries. Her story and that of Christina of Bolsena seem to have been confused and combined in rewrites through the ages. Youngest of eleven children born to Manual and Lorenza; six of her siblings died in childhood. Her mother died when Marciana was three, and she decided to devote herself to the Blessed Virgin Mary as her new mother. She daily went to Mass, prayed the rosary, and spent hours in Eucharistic adoration. Worked with Father Juan Vicente of Jesus and Mary on the magazine La Obra Máxima (The Ultimate Work) and other projects. She was drawn to religious life, but the care of her father and other family members kept her at home for several years, but on 14 July 1929 she joined the Discalced Carmelites at the Carmel of San José de Guadalajara, taking the name María Angeles of Saint Joseph. Martyred in the Spanish Civil War. Baptized on 7 March 1880, and made her First Holy Communion on 30 June 1890. She was a pious child who attended Mass nearly every day. Devoted student, a painter, and she excelled in needlework. Nun, entering the Society of Saint Teresa of Jesus in 1904 in Tortosa, Spain. Assigned to the motherhouse in Barcelona, Spain in 1920. On 19 July 1936 her community was forced by anti-Catholic government authorities to abandon their house and school. Mercedes was arrested and executed for the crime of being a nun. Youngest of eleven children born to Gabino Martinez and Luisa Garcia; eight of her siblings died in childhood; her surviving siblings became a priest and a Carmelite nun. Jacoba joined the Discalced Carmelites at the San José de Guadalajara convent on 12 October 1898, taking the name María Pilar of Saint Francis Borgia, making her profession on 15 October 1899. A seamstress and lace maker, noted for her skill in embroidery; she devoted all her needle work efforts to the glory of God. Sacristan of her house. Martyred in the Spanish Civil War. Second son of Thomas Lambton of Malton-in-Rydall, Yorkshire, England, and Katharine, daughter of Robert Birkhead of West Brandon, Durham, England. Joseph studied at the English College in Reims, France beginning in 1584, then at the English College in Rome, Italy beginning in 1589. Ordained in 1591. He and Blessed Edward Waterson returned to England to minister to covert Catholics on 22 April 1592 during the persecutions of Queen Elizabeth I but were almost immediately arrested, imprisoned and executed for the crime of being a priest. Martyr. Born to a poor but pious farm family, one of nine children born to Juan and Micaela. Joined the Missionary Oblates of Mary Immaculate on 14 August 1930, and made his perpetual vows on 23 December 1934. Studied in Pozuelo, Spain. Sub-deacon studying for the priesthood when he was martyred in the Spanish Civil War. A pious youth. As soon as he was old enough, Arnulf left home to make an endless pilgrimage to shrines and relics throughout France. While on the road, he was beset by thieves who were certain he was hiding money; he wasn't. They beat him to the point that he lived long enough to be brought to the town of Gruyere, France and receive Communion one last time. Dominican priest. Missionary to Vietnam in 1805. Provincial vicar at Tonkin. Martyr. Born to a wealthy and socially prominent family, the son of a lawyer. Studied at the University of Padua. Physician. Franciscan friar. Franciscan Provincial for the Marches on five separate occasions. Born to the nobility, the daughter of Blessed Amadeus IX, the duke of Savoy. Cousin of Saint Joan of Valois. Married to Hugh of Châlons in 1479. Widowed in 1489. Joined the Poor Clares at Orbe (in modern Switzerland), and was assigned to beg food for her house. A convert, he was baptized by and became a spiritual student of Saint Colman. Monk. 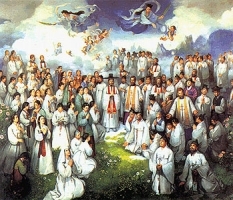 Trained as an evangelist by Saint Diomma of Kildimo. Worked in Ireland before the arrival of Saint Patrick. Pilgrim to Rome, Italy. First bishop of Ardmore, Waterford, Ireland. Known as a miracle worker. Studied at the University of Bologna. Founder of the Gesuati. Bishop of Ferrara, Italy in 1431. Translated the Bible and other sacred writings into Italian. Born to a pious family. Joined the Salesians in 1932. Studied at the Gregorian University in Rome, Italy. Priest. Martyred in the Spanish Civil War. Priest in the diocese of ávila, Spain. Martyred in the Spanish Civil War. Son of Saint Vladimir, Duke of Muscovy. Grandson of Saint Olga of Kiev. Brother of Saint Gleb. Martyr. Mercedarian friar in Fuentes, Spain. Missionary, sailing to Cuba with Christopher Columbus. There he converted many and built several monasteries. Martyr, possibly the first Christian killed for his faith in the New World. Relative of Pepin, Mayor of the Palace to King Dagobert, and a member of the Dagobert court. Wishing to devote herself to God, she fled the court to avoid an arranged marriage and died from exposure. Mercedarian friar in Spain. Came to the Americas with Francisco Pizarro and Diego de Almagro. Missionary in Panama, and then in Cuzco, Peru. Martyr. Nephew and spiritual student of Saint Wandrille. Benedictine monk under Wandrille at Fontenelle Abbey. Founder and abbot of Oye Abbey at Sezanne-en-Brie, France. Seventh century prince, born to the royal family of Mercia, England. Baptised by Saint Chad. Murdered by his pagan father. Martyr. One of seven Christian brothers who were soldiers in the imperial Roman army. Kicked out of the military, exiled and eventually martyred in the persecutions of Maximian. Born to the nobility of Aquitaine (in modern France). Married. Widow. Nun and later abbess at Troclar Convent in southern France. Anglo-Saxon princess. Nun in Flanders, Belgium. Fifth-century nun, martyr by pagan Saxon invaders, and venerated in Seaford, Sussex, England. Eighth century abbot of Saint Augustine's Abbey in Pavia, Italy. Bishop of Sens, France. Fought Arianism in his diocese. 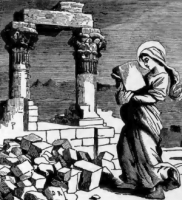 Sister of Saint Niceta. Third-century convert. Martyr.